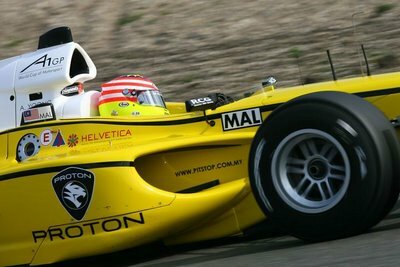 Congratulations to A1 Team Malaysia and Alex Yoong for winning the Sprint and Feature Race of the A1GP round 2 at Brno last weekend. Check this out, pitstop's url on A1 Team Malaysia car last weekend at Zandvoort. Many thanks, A1 Team Malaysia! 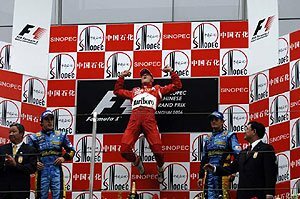 Michael Schumacher chased away his Chinese jinx with a thrilling win on the outskirts of Shanghai as he drew level with Fernando Alonso in the World Championship with two races to go. Michael and Scuderia Ferrari Marlboro timed their pit stops to perfection, making the right tyre choices as the track dried, while Michael's championship rival made life difficult for himself by changing to a new set of intermediates at his first pit stop, when others stayed on worn sets. Michael's moment came when Giancarlo Fisichella ran wide as he exited the pits after his second stop and ran wide, allowing the Ferrari driver into the lead which he held to the end. 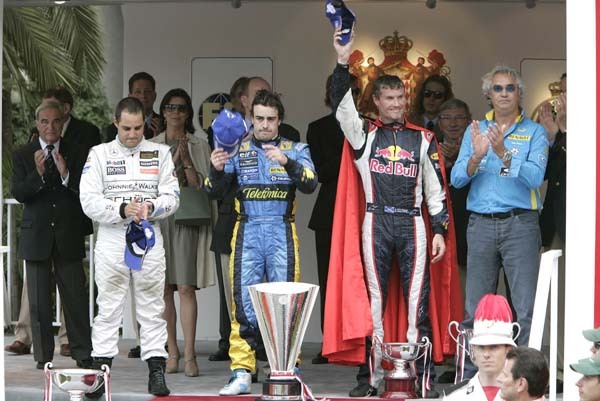 Fisichella eased up, allowed teammate Alonso to overtake thus limiting his loss to his two point lead in the championship so that they are level as they go into the final two rounds of the championship. 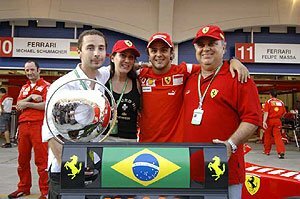 Felipe Massa, after his engine penalty, fought hard to drive through the field but David Coulthard turned in on him as he came down the inside to overtake at the hairpin and the resulting damage put the second Ferrari out of the race. The 56 lap race started on a damp track in front of a huge and enthusiastic crowd. All cars were on intermediates and the Renaults took the lead, although Kimi Raikkonen made a superb start and tried to come around the outside, eventually slotting into third, overtaking the Hondas of Jenson Button now ahead of teammate Rubens Barrichello. 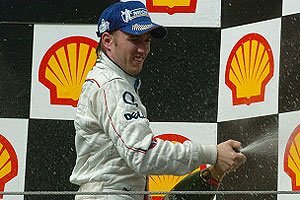 Michael stayed sixth, Pedro de la Rosa stayed seventh but Scott Speed picked up three places for eighth, ahead of Nick Heidfeld and Tonio Liuzzi. Alonso quickly pulled away at the rate of a second a lap from Fisichella who held off Raikkonen. 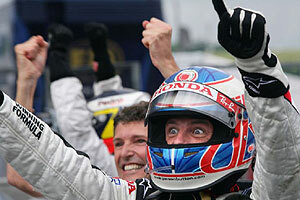 Button was next, leaving Barrichello to hold off Michael Schumacher and the pair were caught by de la Rosa. But out of the hairpin on lap eight, Michael overtook his former teammate to move up to fifth place. By lap 12, Alonso had a 15s lead over Fisichella under real pressure from Raikkonen who got by on the next lap, while Michael caught and passed Button on the straight to move into fourth place. Button was one of the first to stop on lap 15 with Raikkonen coming in a lap later, but he only lasted two more laps before he pulled off with a throttle problem. That left Alonso with a 19s lead over his teammate, but Michael was now on Fisichella's tail. They had a lengthy lead over Heidfeld in fourth, Mark Webber was fifth from Barrichello who had come out ahead of teammate Button. Kubica and de la Rosa were next. Michael made his first pit stop on lap 21 and left the tyres on the Ferrari whereas Alonso came in a lap later and fitted new tyres. Fisichella pitted a lap after that and also left his wets on. Alonso's stop had already cost him an extra eight seconds so that he was now only 10s ahead of his teammate while Michael was only a couple of seconds behind Fichella. Kubica pitted on lap 24 and Heidfeld a lap later, close to half distance. 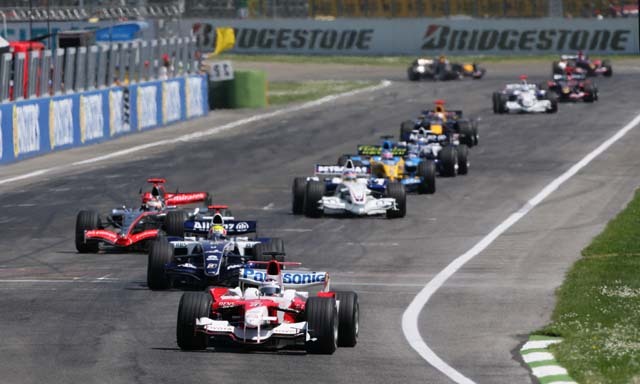 Alonso rapidly lost time, so that his 10s lead had disappeared within four laps and although Fisichella overtook his teammate on lap 29, Alonso got ahead again immediately, and the Italian had to wait another lap before he could make it stick. A lap later Michael also overtook his championship rival. 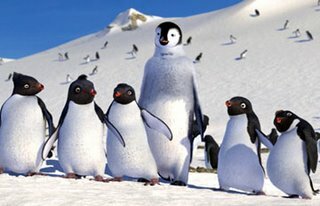 On a drying track, the pair left Alonso behind so that he was 7.7s behind before he finally changed to dries on lap 35. Michael was right on Fisichella's tail when he brought the Ferrari in for its second stop on lap 40 and Fisichella came in a lap later. But the Italian slid straight off as he rejoined, and Michael nipped through and into a 10 second lead. 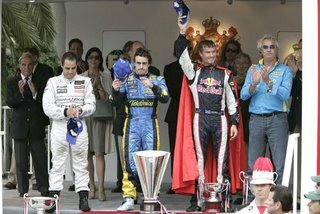 There was no surprise that Fisichella eased up and allowed Alonso to overtake but by then Michael Schumacher was heading to the chequered flag, drawing level with Alonso in the championship. Renault, however, regained a tiny one point lead in the Constructors. Heidfeld was heading for fourth place when he was blocked by a slower car and hit by the closely following Barrichello who spun him, so Button nipped through for fourth, de la Rosa claimed fifth and Barrichello sixth from the recovered Heidfeld and Webber. The FIA were investigating the incident late on Sunday night. 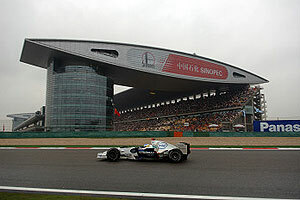 Massa fought his way up from the back to the grid to fifth before his pit stop, rejoining tenth and then working his way up to ninth before his car-damaging collision with Coulthard. The championship now moves to Japan next weekend before the finale in Brazil. 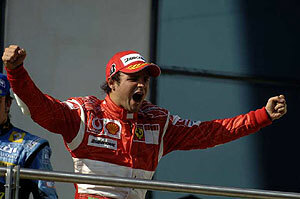 Michael Schumacher can win the championship next weekend, but Alonso cannot.